In addition to our bounce houses and water slides, we've also got a variety of other exciting party rentals! Take the Trackless Train rental for instance, a unique attraction that lets your guests enjoy a leisurely ride in a train that can travel through different types of terrain! 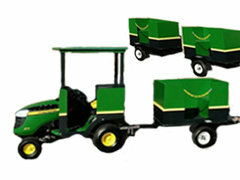 The Trackless Train consists of four attached carts, with the front cart serving as the caboose. Impress and delight your guests with the Trackless Train and make your reservation today! Remember to reach out to us directly at Bounce E Bounce, LLC if you have any questions. Scroll down to see all trackless train rentals & click on the title or image for more info & online ordering.